Students from two Catholic schools in the Philadelphia Archdiocese — SS. 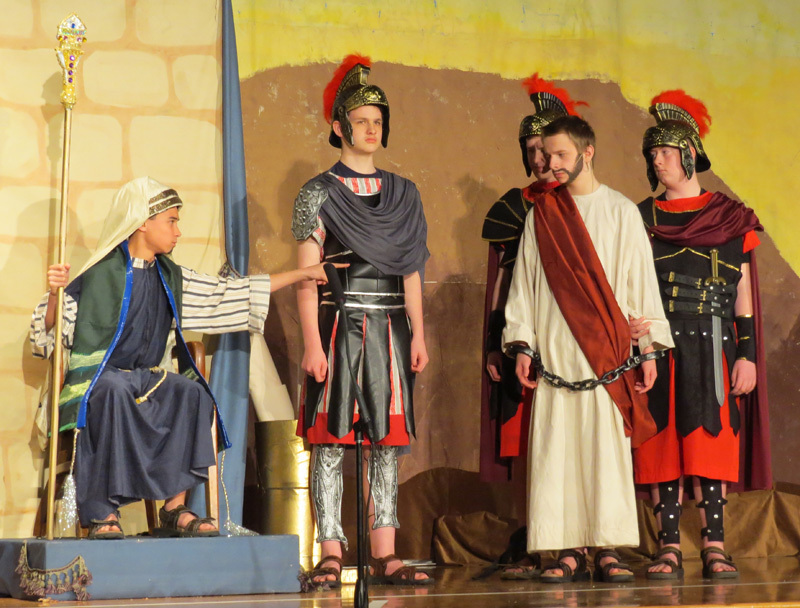 Philip and James and St. Katharine Drexel Regional — reenacted scenes from the life of Jesus, including his passion and death, during Holy Week. Eighth graders from SS. 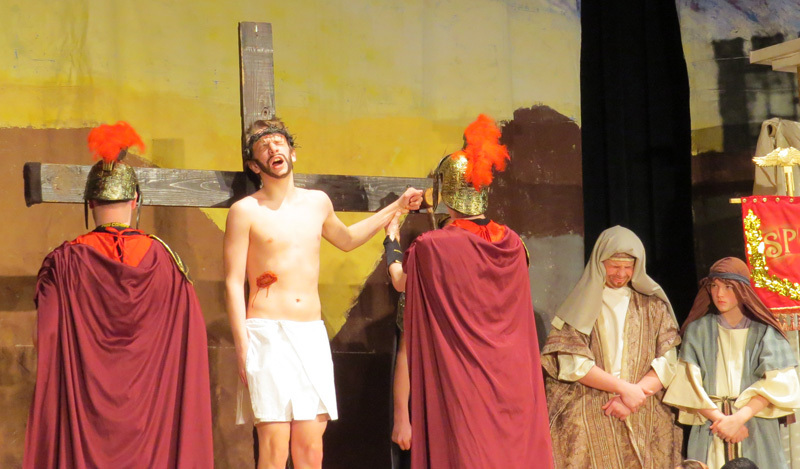 Philip and James School in Exton performed the Living Stations of the Cross for the school and parish community March 27 and 29. The Stations of the Cross are the 15 scenes on which Catholics meditate about the suffering, death and resurrection of Jesus Christ. The students portrayed tableaus of three stations at a time as other students narrated and reflected upon the scenes. When the actors changed scenes, the choir sang traditional Lenten hymns. 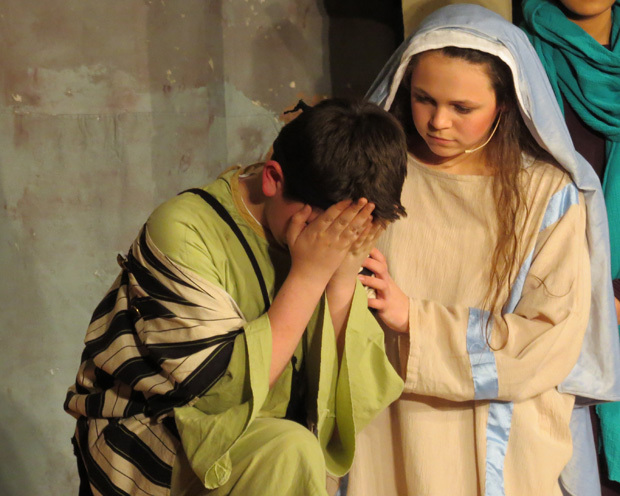 The performance was a prayerful way for students, families, parishioners and friends to enter into the paschal mystery. 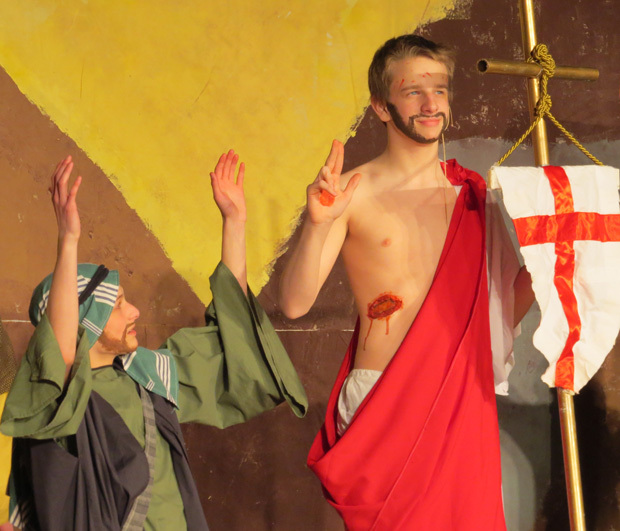 Station III – Jesus Falls the First Time: (From left) Alexa Peterson as a soldier, Andrew Scheuermann as Jesus, Jessie Stranen as a soldier. 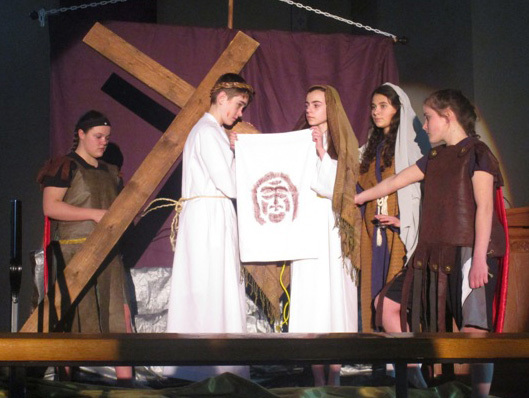 Station VI – Veronica Wipes the Face of Jesus: (From left) Alexa Peterson as a soldier, Robert Monaghan as Jesus, Anne Bonini as Veronica, Madalyn McClay as a woman, Jessie Stranen as a guard. Station VIII – Jesus Comforts the Women of Jerusalem: (From left) Megan Hartz and Anne Bonini as women in the crowd, Grace McKelvey as a soldier, Matt Bertolami as Jesus, Natasha Karnoto as a soldier, Madalyn McClay and Julia Thomas as women. 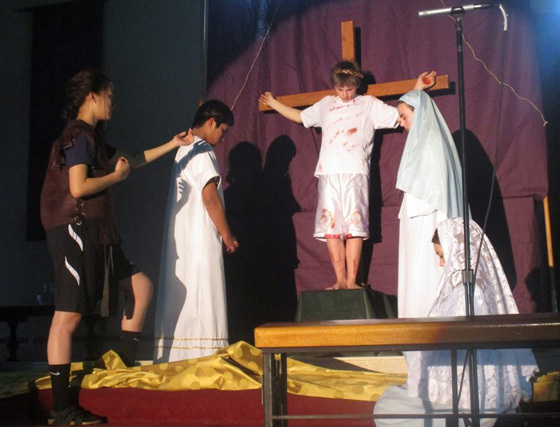 Station XII – Jesus Dies Upon the Cross: (From left) Natasha Karnoto as a centurion, David Carangan as John, Patrick Elisii as Jesus, Anne Bonini as Mary, and Megan Hartz as Mary Magdalene. 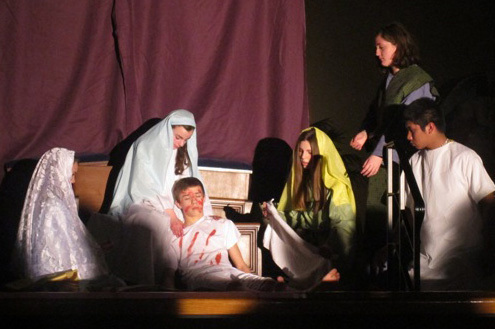 Station XIII – Jesus is Taken Down from the Cross: (From left) Megan Hartz as Mary Magdalene, Anne Bonini as Mary, Anthony Bertolami as Jesus, Julia Thomas as Joseph of Arimathea, Kathleen DeAngelis as Nicodemus, David Carangan as John. 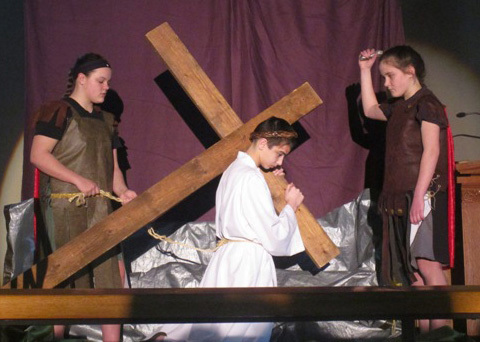 Eighth graders of St. Katharine Drexel Regional Catholic School in Holland enacted the Passion Play of Jesus’ life before his death on the cross on March 29 and 30. 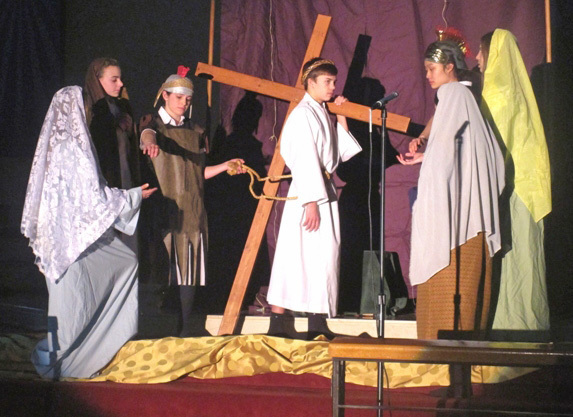 Part musical and devotional, the senior project of the students involved every eighth grader as a major contributor. The Passion Play tells the whole story of Jesus’ life, from his birth to his resurrection, and was written and produced by Msgr. John Marine, pastor of St. Bede Parish in Holland — one of the school’s feeder parishes. 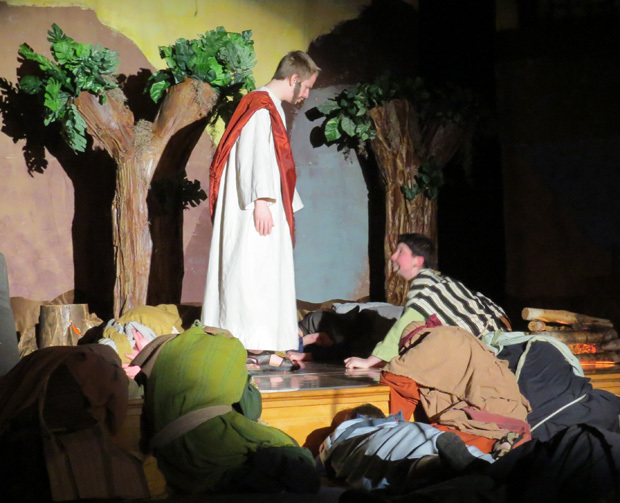 The 10th annual Passion Play, directed by Gerri Brooks, was performed in the St. Bede Parish center.